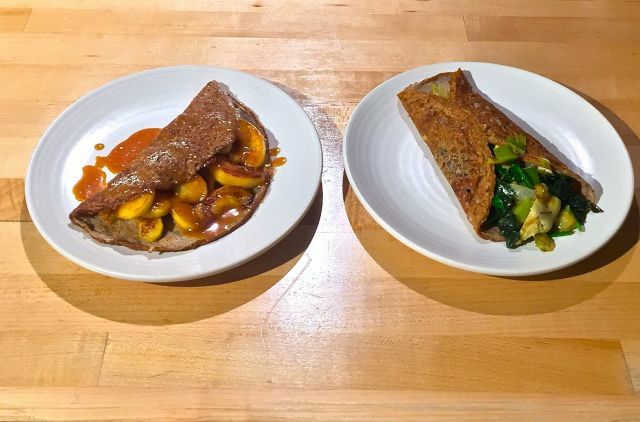 This Wednesday brings Sara Nafatly's Breton-style crepes, Marmite soup, and fresh juice to a little counter inside Chophouse Row. The biligs have been burned; bring on the crepes! 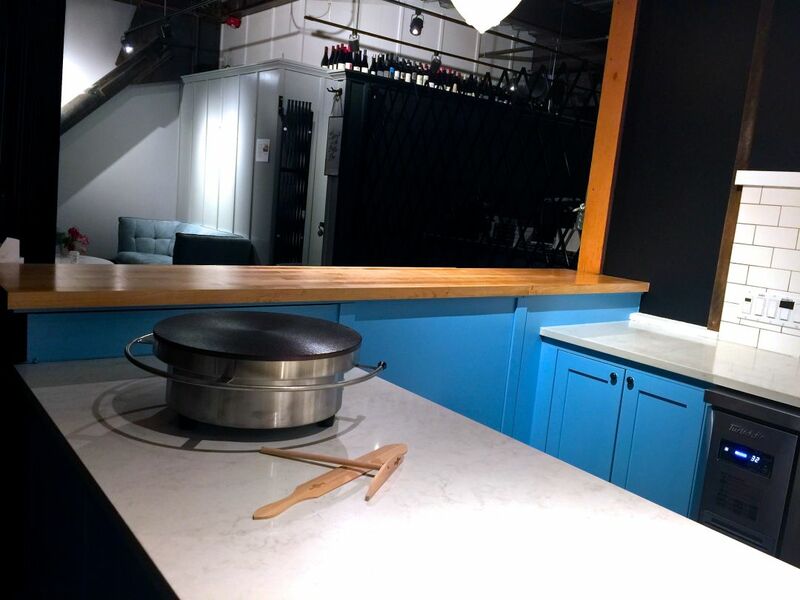 Inside the labyrinth of Chophouse Row, tucked behind a jewelry boutique and Marmite, is a four-seat countertop dressed in white subway tiles and Marseille blue. This wee space is home to crêperie Petite Galette, which softly opens this Wednesday, January 31. 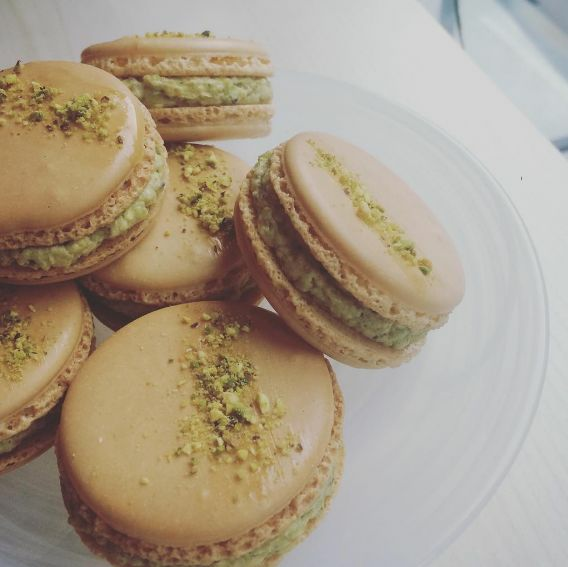 Petite Galette is the brainchild of Sara Naftaly, baker-owner of Amandine Bakeshop who also helps husband Bruce Naftaly run things at Marmite, and Tallulah Anderson, the managing partner of the project. It makes perfect sense that this collaboration would also take on a similar sensibility next to the Naftaly's French establishments. Plus, there's the nostalgic pull of this particular crêpe. "Traveling through Brittany in the early '70s, I always loved seeing the Breton women wearing their extravagant lace hats," says Naftaly. It's this early childhood memory of Breton-style crêpes, the taste of the "heartiness of buckwheat" at maybe six years old, she says, that inspired Petite Galette. Those buckwheat crêpes will be fairly classic: the Toute Verte consists of green vegetables and garlic or a straightforward ham, cheese, and egg. Apple cider crêpe and the Toute Verte. Breaking from tradition a bit, there'll be one seasonal sweet crêpe. For winter that looks like an apple cider crêpe filled with Newtown Pippin apples drizzled with caramel. As always, menus shift and change, evolve and progress. But as things develop, says Naftaly, they plan to stay true to the Breton approach. Anderson, who's running the juice end of things, says to expect a lineup of "simple flavors with the occasional hint of something unusual." Take one such combo as carrot and orange whose sweetness is tempered by some grapefruit juice and a pinch of dried sumac. Anderson met the Naftalys when she started doing marketing work for the restaurateurs, which overtime naturally shifted into this partnership. 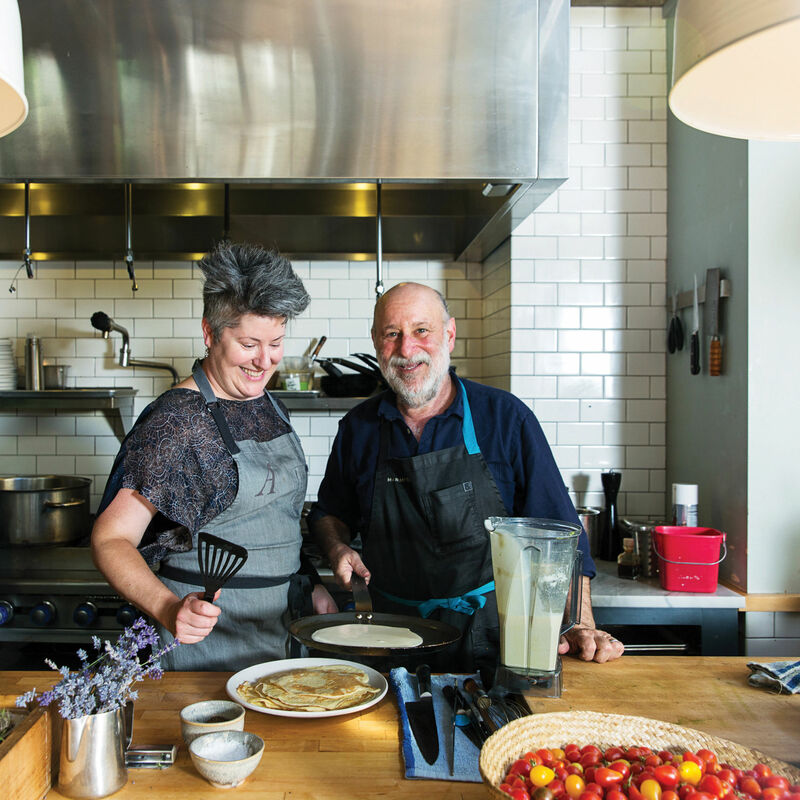 "I had a skill set from my previous life in restaurants that was not being utilized," says Anderson, "so when Sara asked me to work with her on Petite Galette I was thrilled." Beyond Breton crêpes and fresh juices, there will also be kombucha, soup from Marmite, then hopefully beer, wine and cider down the road. And once things are up and running, there could be even more offerings coming out of this tiny countertop space. Petite Galette will be open from about 9 until 6, Monday through Friday, and from 10 until 5 on Saturday, then closed on Sunday (for now). Be patient, ye crêpe-enthused. Hours might change slightly during and after the soft opening. And finding the hidden crêperie can be tricky, follow the smells of crêpes on the bilig, or you know, take a stroll down the Chophouse Row walkaway and around to the courtyard side entrance. If you've passed Good Weather Bikeshop and Cafe, you've gone too far, friend.